We’re excited to announce that Kingsbridge is the first town in the South Hams to receive the coveted Surfers Against Sewage ‘Plastic Free Community’ status. A team of local volunteers, keen to reduce the plastic pollution originating from our town, have been working together tirelessly to secure the town’s plastic-free status. They’ve been required to meet 5 objectives set by Surfers Against Sewage as part of their campaign to inspire grass roots action to reduce plastic use in communities nationwide. Last month, Kingsbridge Town Council unanimously voted to support Plastic Free Kingsbridge and commit to reducing single-use plastic in council premises. Businesses in the town have welcomed the initiative. Several are currently working toward their ‘Plastic Free’ status and six have already qualified. See below for more details. Next time you’re in Kingsbridge, look out for ‘Plastic Free Approved Business’ window stickers and be sure to give those businesses your support. The wider community has also been involved, with awareness-raising talks taking place at Thurlestone & West Charleton Primary Schools, 1st Kingsbridge Girl Guides, the Chamber of Commerce and the ÜNIT coffee shop, as well as a paddle and pick with Waterborn and the 6th Kingsbridge Sea Scouts. Forest & Beach have also been regularly educating children on using less plastic at their holiday clubs, residentials and primary forest schools, including Kingsbridge Primary. Kingsbridge Community College has been educating students about the issue, providing compostable packaging for most meal choices, and have recently launched a new reusable cup with a discount every time students purchase drinks for it. They’re also looking into strategies to reduce the number of plastic bottles bought on the school premises. Kingsbridge Rugby Club has replaced plastic straws with paper, plastic forks with wooden and polystyrene burger boxes with cardboard. They no longer have cans of drinks but sell refills and are replacing disposable plastic pint cups with reusable beakers. Meanwhile, last month’s Food & Music Festival saw food being served in compostable packaging, and around 5,000 compostable drinks cups diverted from landfill and taken to a local farm for composting and returning to the soil, leaving zero waste. 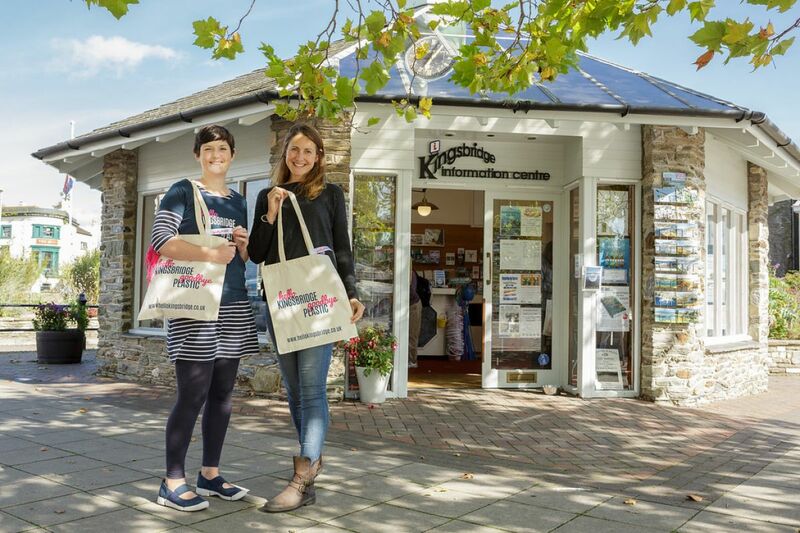 Other significant plastic-free activities in Kingsbridge include the popular ‘Hello Kingsbridge, Goodbye Plastic’ Borrow-A-Bag scheme, ‘Refill Devon’ free reusable water bottle refills, and regular plastic clean up events including Plogging, Paddle & Picks, Street Cleans and monthly South Hams Beach Cleans. Thank you to everyone in Kingsbridge working hard to discover new ways to do things using less plastic; to the team of volunteers who co-ordinated the ‘Plastic Free Kingsbridge’ project: Sam Dennis, Crispin Jones, Agi Ostrowska, Monika Malak, Sally Ann Jones, Pete & Andrea Moore, and Amanda Keetley; and also to Surfers Against Sewage for providing the framework for the scheme. Amanda Keetley said: “Receiving ‘Plastic Free Kingsbridge’ status from Surfers Against Sewage is important recognition of the efforts of very many local people and organisations over the past few years in taking action to reduce ocean plastic. We’d love to inspire even more Kingsbridge-based residents, community groups, organisations, schools and businesses to get involved and discover ways to use less plastic, whilst providing a focal point for local people who are passionate about the issue to meet, share ideas, and do community clean ups, to keep each other feeling positive that acting together we can make a difference”. Products – sell plastic free alternatives such as menstrual cups, bamboo toothbrushes, shampoo and soap bars, etc. If you’d like be listed as a ‘Plastic Free Kingsbridge’ business or community organisation, and receive your ‘Plastic Free Approved Business’ window sticker, please feel free to take inspiration from the ideas above, and get in touch to tell us about the changes you’ve made: [email protected]. If you’re passionate about plastic pollution and keen to participate in plastic clean ups and other community activity, please like us on: https://www.facebook.com/SouthHamsBeachCleanSeries/ and keep in touch that way.